I am so excited for this post for two reasons. 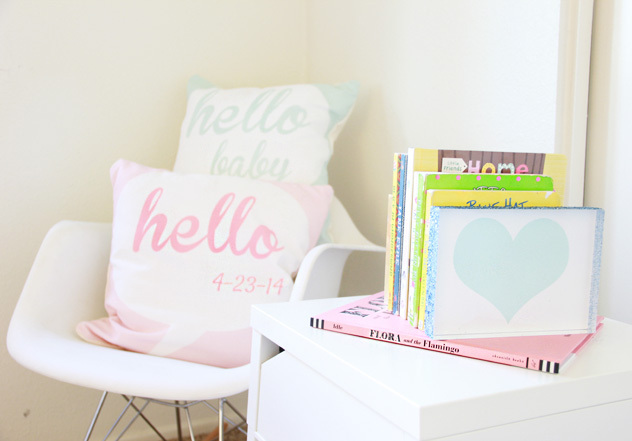 One- I got to work with the amazing brand, Shutterfly, to create beautiful nursery decor. 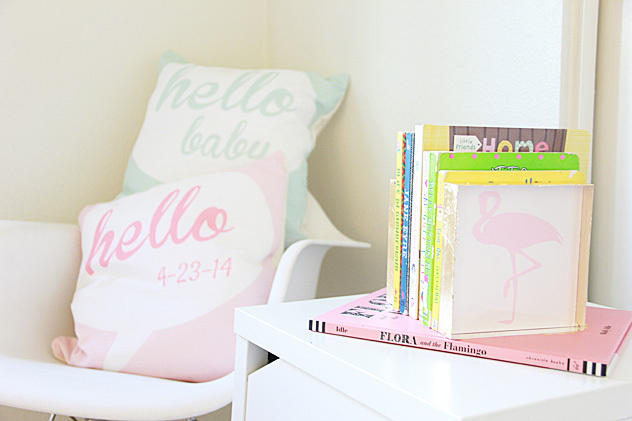 Two- these are the first glimpses of Colette’s nursery I have put on the blog. She is 7 months old, I am way behindddd with updating you! 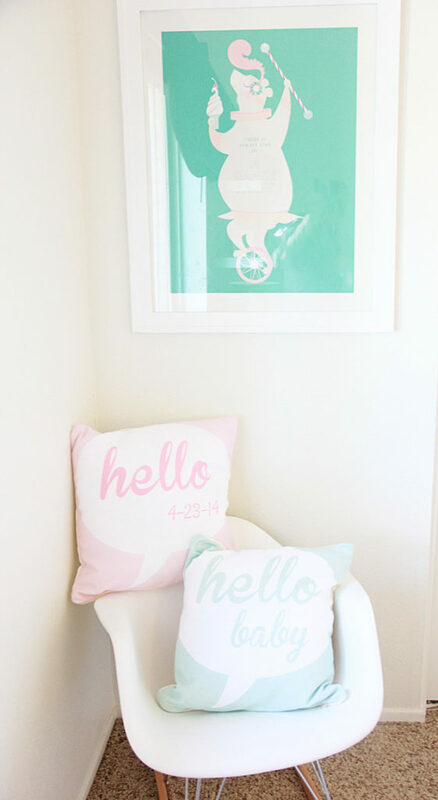 I did two versions of a Hello talk bubble pillow. A Hello Baby! pillow that would make a great gift anytime before or after baby is born. 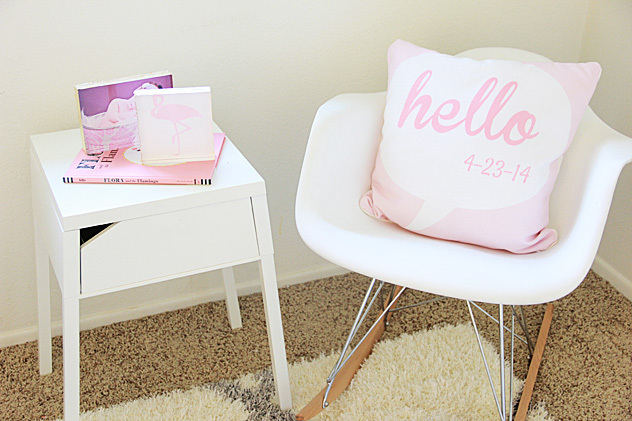 The second pillow is a Hello with the new baby’s date of birth and a very personalized after the baby is born gift! Upload the image you want (downloads here) and click Add to Cart. You will receive a warning that a text box or photo has been left empty, press Ignore and you can add to cart! I included both the pink and blue Hello Baby images and a .psd file if you are able to edit to write in your own date. If you cannot, feel free to email me! Now onto glitter and gold! 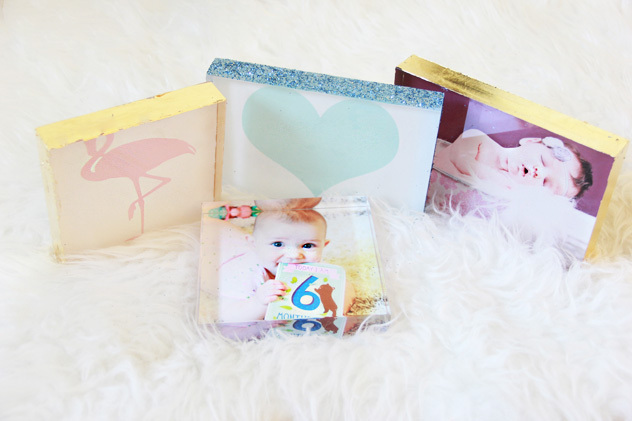 I loved the acrylic photo blocks and added a little color to the edges for a quickie diy. Remove sheet and you are done! 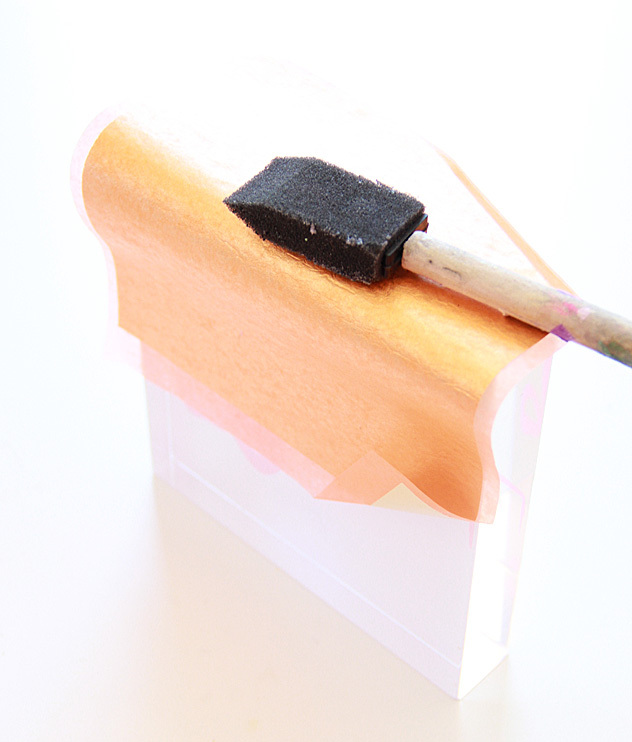 To glitter the side of your frames, brush mod podge onto frame edges. Apply glitter immediately (no waiting like the gold leaf) Shake off excess glitter and using a clean brush you can brush away any glitter that fell on non-mod podged part of frame. To keep glitter from shedding (important in a nursery!) Finish the glitter sides using Clear Gloss Enamel Spray (found in spray paint department). 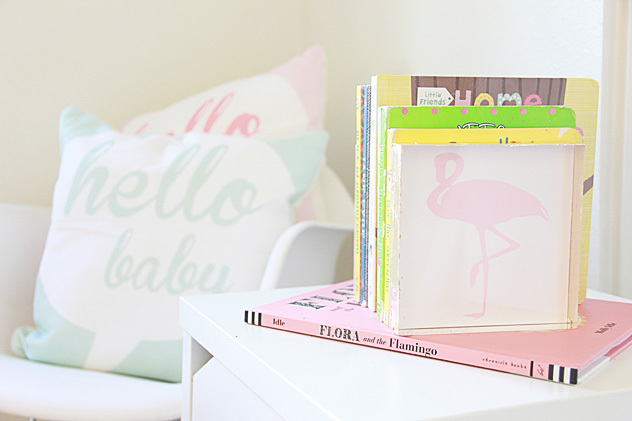 Colette’s nursery is pink and aqua themed- I chose a pink flamingo and an aqua blue heart for two of the acrylic blocks. 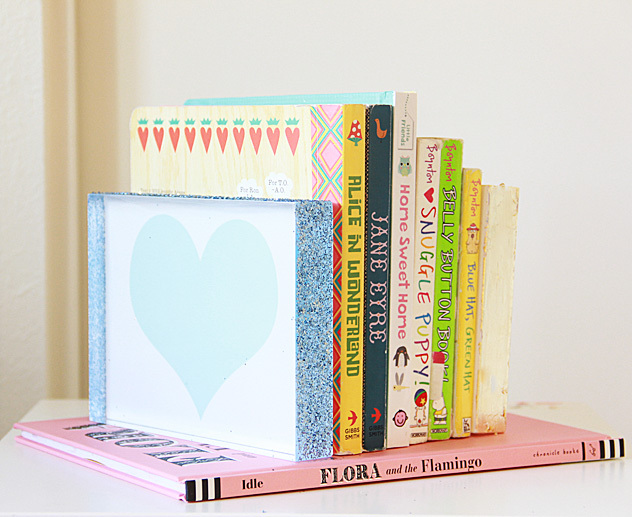 The acrylic blocks work great as bookends. 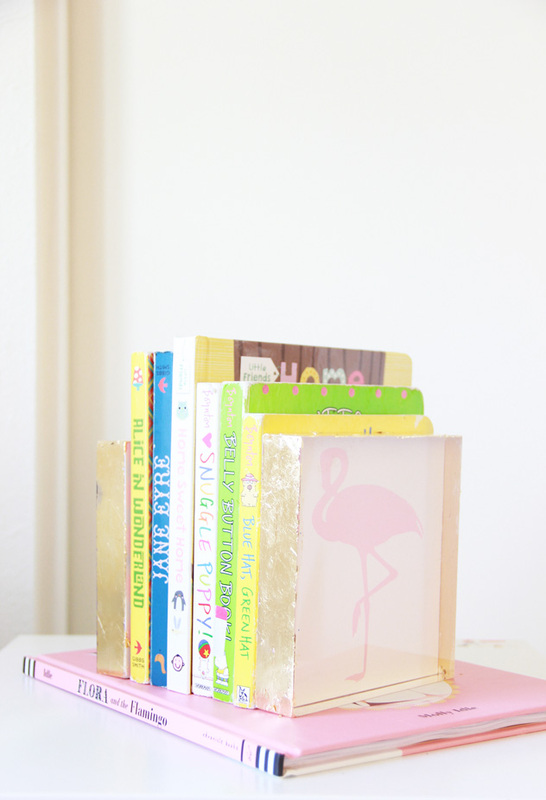 And here they are not in use as bookends- adorable! Also, I did not forget Colette’s birth date, I used the date of my best friend’s baby to surprise her with a gift! So, there is a little glimpse of our nursery- the chair is Kalia’s- her very own rocking chair in the room for those long days in the beginning of frequent nursing her sister. I wanted Colette’s nursery to be a fun place for Kalia to hang out in as well! The books are some of her favorites too- Blue Hat, Green Hat- I love that book! Post sponsored by Shutterfly- ALL opinions are my own, thank you for supporting sponsors that make A Bubbly Life possible!